As we continue to take a closer look at all of our many wonderful Michigan vendors, we head once again to the bustling Northern Michigan micropolitan of Traverse City for, you guessed it, cherries! While we strive to offer diverse products featuring unique ingredients and themes from around the state, no Michigan themed store is complete without cherries. 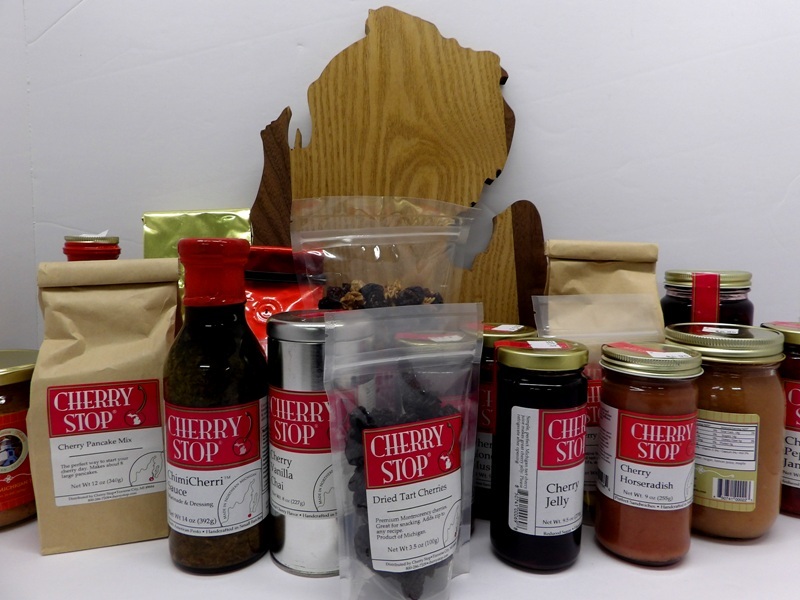 At Tip’n the Mitten, while we offer more than one vendor who features cherries, Cherry Stop is by far, one of our most popular and certainly most “cherry” themed. With us from the start, we invite you to learn more about Cherry Stop and what makes them so special! Owned and operated by Jaime and Nick Roster, Cherry Stop has been providing us with many great cherry related products from the very start. From dried cherries to cherry jelly, cherry pancake mix an even a chimi cherri sauce, Cherry Stop offers something for almost everyone. We are proud and happy to have Cherry Stop as a part of our store here at Tip’n the Mitten and thankful for a great company with great owners who are always there when we need them! If you would like to find out more about Cherry Stop and all that they can offer you, we invite you to come into the store and sample a few of their amazing products! If you would like to find out more online, visit Cherry Stop at their website at thecherrystop.com or find them on facebook here. Tip’n the Mitten is a Michigan-made store featuring all Michigan-made food, gifts and more in the heart of downtown Grayling, MI.